SOUTH HADLEY – With the town’s huge new public library now open, residents may be thinking big. But the Girl Scouts of Troop 11253 are thinking very small these days. In working toward their Silver Award, they have erected little free libraries in South Hadley at sites at the Village Commons and at the Beachgrounds. They will soon erect a third at Buttery Brook Park. Think birdhouse size and you’ll understand the appeal of the freestanding lending libraries. Scout Leader Martha Guild said the girls, whose troop meets at the Center Church, built six little windowed libraries at a cost of $350. But she said the girls’ cookie funds paid for the bulk of the project, the materials and the official signage. Co-Leader Karen Gelinas said the girls had to do a service project, “something to better the community,” adding, “It has to be sustainable. They all love the idea of doing something around children and literacy. They had to write a proposal to the Girl Scouts and they all had to have a leadership role.” That in turn led to the little library idea. Moriarty was the book drive director. “I supplied the books for the little library,” she said. She set up a book drive, collecting everything from picture books to adult titles. Abbie Carey, 14, was publicity director, putting together a flyer on the project, contacting the media and getting permission to put the boxes up. Carey said they tried to provide booths for various age groups. “We had some adult books too,” she said. The idea was to read a book, then return it for the next reader, and even donate a book that someone else could then enjoy reading. The Girl Scouts bought the materials, but Fabricious generously gave them scrap wood from previous projects. Alyssa Croteau, 13, partnered with Jayda Aponte, another Grade 8 student in the troop. “We did a book story time in park for little kids,” she said, reading to them on Mondays at the Beachgrounds. As for the finished little libraries, she said, “I was really happy that they were completed because we took a lot of our time and effort to build them.” How many hours? “A lot” was her succinct answer. Olivia Wilson, 13, was the builder. “I feel happy we got to contribute to the community and the education of kids,” she said. 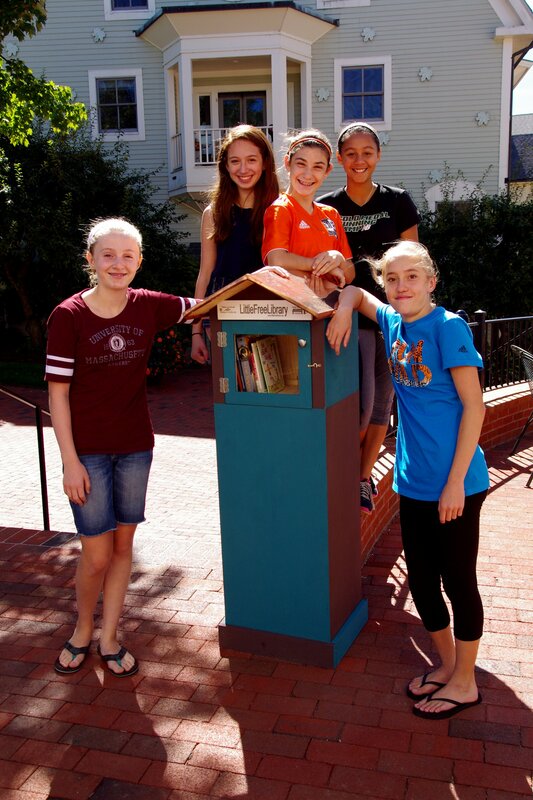 While the Girl Scouts were discussing their roles in the little libraries project, satisfied customer Judith Dyjach of South Hadley shared her appreciation for the library. “We have three children who love to make a trip up here to borrow a book,” she said, adding, “It’s great that people can bring books and bring them back. It’s wonderful to inspire people to read. The little free libraries will take a winter break before going back up in the spring. Guild said, since sustainability of the project is a requirement of the Girl Scouts, they are currently looking for an organization to take over the care and maintenance of these little libraries. They also want to pass on three of the remaining six boxes to another town so they can start up the little free library project.